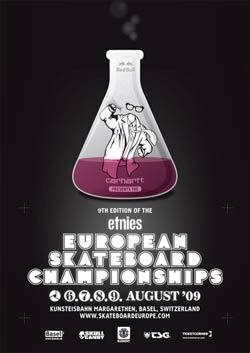 Carhartt would like to introduce a series of experiments in anti-gravity, human particle collisions and theories of relativity, called the etnies EUROPEAN SKATEBOARD CHAMPIONSHIPS. The series of tests is happening from the 06. – 09. of August 2009 in the Margarethen Kunsteislaufbahn in Basel, Switzerland. More than 300 skateboarders from over 20 nations are expected to examine the new streetcourse build by IOU-Ramps to try to defy the forces of gravity. On Thursday the youngster’s skills are being analysed in the Junior Champs in three different age groups for skateboard scientists below 16 years of age. The best of the newly discovered talents will be mixed together with the older competitors on Saturday. Saturday is the day for the gravity tests in the miniramp with a solid qualification followed by countless interactions on the streetcourse in the street qualification. The ladies start off Sunday with the Girls Jam and the studies continue with the finals during the day in miniramp and street. A weekend full of fantastic skateboarding, nice music, good friends and a lot of fun is the proof for a valid collaboration of etnies, carhartt and a lot of helpers, who made it possible for the 9th time in a row to celebrate the defying of gravity called skateboarding. Additional research partners are Element, Skullcandy, TSG, Red Bull and Basel.